A brand new look of our restaurant LA CHÈVRE d'OR ! Every year, CHÂTEAU DE LA CHÈVRE D’OR closes its doors from November to March, to gather its strength, reflect on the season left behind and reborn like a Phoenix for the new season. This year, we invite you to discover the transformation of our gourmet restaurant LA CHÈVRE D’OR. 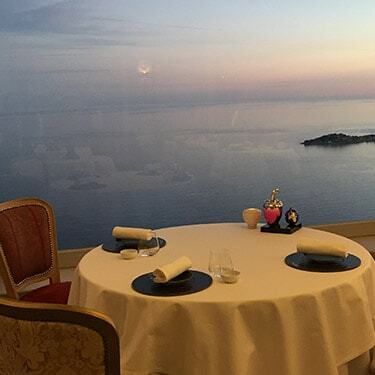 With our 2 Michelin stars preciously kept through the years since 2000, our guests will taste the mineral and marine cuisine of Chef Arnaud Faye, in a metamorphosed setting, a drop of gold perched over the Mediterranean, a gastronomic garden between the sky and the sea at the doors of Heaven. A new setting with modern colors, Monegasque porcelain, new recipes full of sun and freshness, a wine menu with both small and major producers, LA CHÈVRE D’OR is the mythical place where the traditional and the contemporary meet. We look very much forward to welcoming you this season. To know more, visit our legal notice, to continue your navigation, click here.